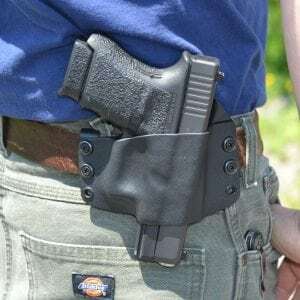 The Protector Knight Guard Package combines The Protector (IWB) Rigid Concealed Carry Holsters and the famous Knight Guard Bedside Accessory to create the perfect affordable package option with our all day carry holster. 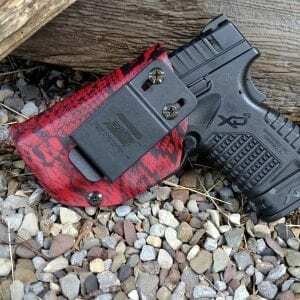 Our Rigid IWB Concealed Holsters utilize set screws that allow for the adjustment of the retention to which your handgun is held, thereby reducing the risk of your handgun falling out and possibly being damaged. This retention system also removes the need to use thumb snaps when you are trying to get at your weapon, minimizing the time between holster and draw. A key feature of our IWB Concealed Carry Holster is the fact that we use ONLY .08 thick Carbon Fiber Material, giving you not only the most durable, but also the best looking product. You can now simply pull your holster out of your waistband and attach it next to your bed. Now when you come home and go to bed simply clip your holster on the Patent Pending Knight Guard, which is a high strength indestructible polycarbonate Holster attachment that you simply place in between your mattress and box spring. Now your handgun is close by in the middle of the night helping you to rest easy. If a crisis does arise no need to worry about fumbling with your gun safe combination. In addition it has a 1 ¼” diameter flashlight holder. Ensuring that both your handgun and a flashlight is always within reach when it matters. Simply drape your sheets over and your handgun is completely concealed when you are no longer in bed. It is recommended that this product not be utilized where children may have access to your handgun or bedroom.